This is “THE” paper for photographic reproduction. Entrada is the personification of America’s very own photo rag and simply makes others look second rate. Entrada’s triple coating gives images a dimensional quality that nothing else matches. 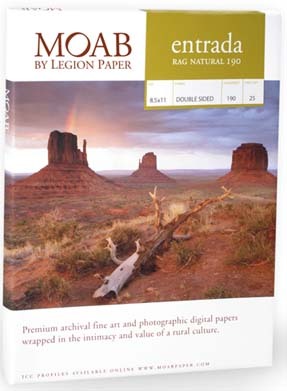 If you want top dollar for your work then this paper delivers in both "Bright" white and OBA free "Natural" versions. Entrada Rag Natural offers all of the bene!ts of Entrada Rag Bright with no optical brighteners (no OBAs). It is an award-winning art paper made of 100% cotton and exhibits a native white surface reflecting the true color of cotton to bring your vision to life. This naturally acid- and lignin-free paper offers an expanded color gamut, natural contrast and high ink load that is compatible with both dye and pigment inks. It lends itself to warm black and white prints as well as soft white color prints. The choice of thousands of fine artists worldwide. Moab Entrada has a unique blend of slight but unobtrusive texture, excellent flatness and rich color. Entrada 300 and 190 are double sided, the higher weight being for exhibition work, the lighter for books and those printers unable to take thicker paper. Entrada 290 is a lower cost option to Entrada 300 - lacking the coating on the opposite side as 290 Entrada is single sided. For those wanting Entrada for book usage please refer to the Chinle Album inserts which are provided in both Entrada bright and Natural. Entrada can be sprayed with Moab’s Desert spray and Aquathane for higher scuff resistance.